“Everyone says that Bordeaux fine wine activity is slowing down, but we don’t seem to be seeing the same market situation: purchases are continuing and we have recorded a high number of entries” Melusine Ampe, Managing Director of Bordeaux City Bond, was delighted to say. The storage warehouse, despite a 70% Asian clientele, has not seen any decline in its activity. “It is true that we’re not seeing many recent vintages (2011 wines are just starting to come in), but there is definitely renewed activity in the older vintages (years we haven’t seen for a while such as the 1990s), in wine from other French regions (and abroad) and other bottle sizes (magnum, double magnum …).” And she also noted that there has been an increase in English, East European and South American clients (80% of their accounts are international). Holding a license to store, issued and controlled by the French Customs, the warehouse is positioned at the top end of the market. With their basic service costing 200 euros/month (which includes the space allocated, movements and storage), they are clearly targeting the grands crus (70% of the cases stored are from Bordeaux châteaux, but they also store Champagne and wine from vineyards in Burgundy, the Rhone valley and Languedoc-Roussillon, as well as California, Italy, Spain …). Describing themselves as a “made-to-measure wine bank,” or as “craftsmen in the art of storage”, Bordeaux City Bond, with their slogan We Treasure Your Wine, was founded in 2009 (under the trade name of Entrepôt Vins Export which translates as Warehouse Wines Export), as the first warehouse storing fine wines and related products under an unlimited customs and tax suspension. The company has now been divided into three units, one for each distinct tax regime: the RFSE warehouse (suspended fiscal dues for export), the customs warehouse (suspended duties and taxes for wines imported from third countries) and the national warehouse (suspended excise duties). The latter has only been open for a month and should eventually represent 40 to 50,000 cases. 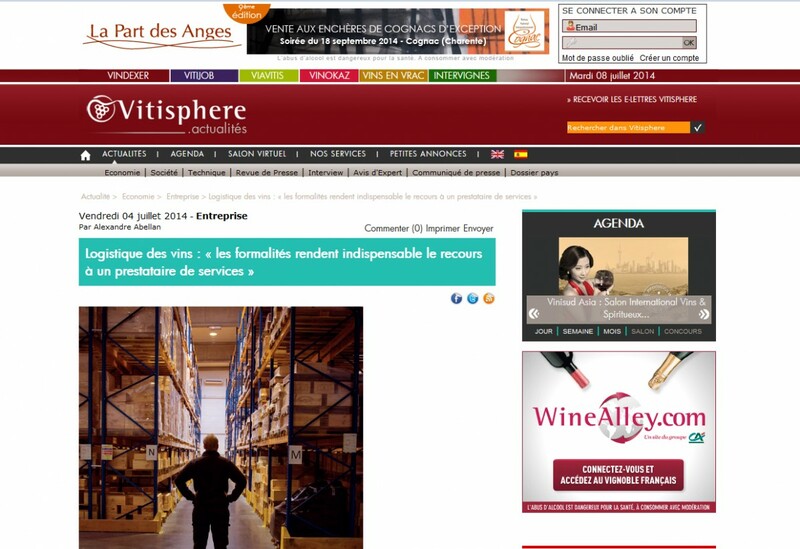 “Which does not put us in direct competition with other warehouses (there are approximately 8 other warehouse companies in Bordeaux: Dartess, Valade, Schenker … ), since it is an additional service which was requested by our customers,” says Melusine Ampe. A year ago, Bordeaux City Bond moved into a 3,600m² reinforced concrete, purpose-built warehouse in Blanquefort (on the northern outskirts of Bordeaux), making them totally independent with the advantage of a perfectly adapted facility (with air-conditioning to maintain the temperature at 16°C, a ceiling height of 11 metres … ). The warehouse currently stores 72,000 cases (out of a total capacity of 150,000), for an insured value of 100 million euros. In 2013, the warehouse achieved a turnover of 750,000 euros (+15% compared to 2012). With a clientele composed of 100 accounts, for 1,000 clients managed through sub-accounts, their clients range from professionals (châteaux, wine merchants, distributors, importers … ) to private individuals (resident outside the European Union). “We welcome anyone wanting to invest in wine (we work for pension funds)” the Managing Director explained, adding that “it’s not just speculation; after all these bottles aren’t intended for watching … but for drinking”. The Bordeaux Chamber of Commerce and Industry owns a 51 % share of Bordeaux City Bond.